8.02 Classical Theory of Electromagnetism. This term I will cover, in addition to the basics, a vast variety of interesting topics including: lightning, pacemakers, electric shock treatment, electrocardiograms, metal detectors, musical instruments, magnetic levitation, bullet trains, electric motors, radios, TV, car coils, superconductivity, aurora borealis, rainbows, radio telescopes, interferometers, particle accelerators (a.k.a. atom smashers or colliders), mass spectrometers, red sunsets, blue skies, haloes around sun and moon, color perception, Doppler effect, super-novae, binary stars, neutron stars, and black holes. Physics, Volume II, for Scientists & Engineers, and the Study Guide and Student Solutions Manual, Third Edition, by D. C. Giancoli, Prentice Hall. All information about this course, including homework assignments, solutions, lecture supplements, and some transparencies shown in lectures, will be made available on the 8.02 website: http://web.mit.edu/8.02/www/Spring02. There will be 36 lectures, 10 problem sets, 3 exams during regular lecture hours, and a 3-hour final. Weekly 15-minute quizzes will be given in recitations. During exams, I expect you to know all material covered in (i) the lectures, (ii) the reading assignments, (iii) the problem sets and (iv) recitations. I will only (but not always) make Lecture Supplements available (on the web) if the topics are inadequately covered in the book. Please hand in your homework on the due dates before 4 PM in room 4-339B. Three problems, randomly chosen, will be graded. Solutions will be made available on the website the day after the due dates. The homework counts for 10%, the weekly quizzes for 15%, each exam for 15%, and the final exam counts for 30% of your course grade. There will be no make-up exams! A missed homework, quiz or exam counts as a zero. Only in case of verifiable illness can you be excused by Professor Wen from taking one of the 3 exams. If at all possible, this should be done before the exam. The 10-11 AM lectures will be videotaped (occasionally also the 11-12 lectures). They can be viewed starting about 1 week later. To accommodate you in preparing for exams, we will air the 3 Exam Reviews day and night on MIT Cable TV (channel 10) every hour on the hour, starting at 5 PM on the day of the Review. The tutoring schedule will be announced on the 8.02 website. There are 28 recitation sections (see schedules). If for any reason you want to change section, please see Maria Springer; she will accommodate you as much as possible. 1. Do yourself (and me) a favor. Read about the topics before I discuss them in lectures. It is not necessary that you study them carefully, but at least get the "smell of it". It would make it much easier for you to follow the lectures and that would make them more interesting. On every assignment you find the relevant reading for the upcoming lectures. 2. Do yourself (and me) another favor. Please try to be in your seats by 4 minutes after the hour. If you have to be late, as a courtesy to other students and to me, come in quietly through the back doors (A & C in the sketch), and take a seat in the back. 3. To students of the first lecture (10-11). 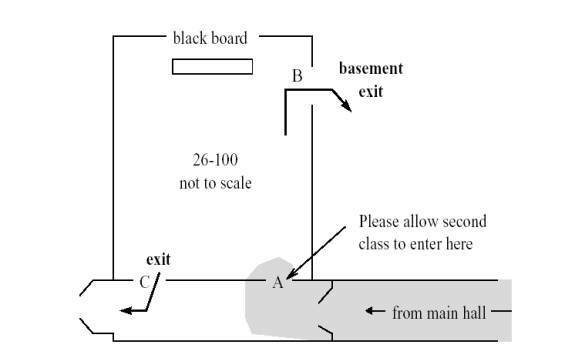 Please leave 26-100 through the exits marked B & C (see sketch). Avoid exit A and the hallway to the main corridor (the shaded area, connecting building 26 with 8). This will allow the second class to get into 26-100 in time. Thanks, and enjoy the course!